Microsoft MVP; QuickBooks Pro Advisor. I used Windows XP (like millions of other users) for about 5 years before Vista, Windows 7 and Windows 8 came along. Sharing a drive or folder between two XP machines was dead easy. Make sure XP was Windows XP Pro (and not Home), turn off simple file sharing and one could NET USE \\otherXPmachine\folder and get connected. During this time frame (2002 through 2008) I had a Windows XP Pro desktop machine and a Windows XP Pro laptop as well. I used Microsoft Briefcase to synchronize files and documents in order to keep things backed up. As an aside, I put an early 60GB 7200-rpm drive in the XP laptop which was both large (at the time) and fast. Unfortunately it was an early Hitachi drive with faulty Hard Drive Protection software in it. I put it on the floor one night to get something. It turned off and never restarted. I put in the old drive, installed Windows XP, ran Briefcase, and was fully up and running in about 2 hours. Vista started to change all this for two reasons: (1) security had been increased and (2) Briefcase and Offline Files did not work properly on large, complex folder structures. On the first point, I could map a folder on XP Pro from Vista Business, but initially I was not able to map a folder on Vista Business from XP Pro. I figured this out eventually, but simplicity was disappearing. On the second point, I opened a case with Microsoft and they had to admit that Briefcase would not handle the size of folder structure I had. I found (courtesy of Experts Exchange if I recall correctly) Sync Back Pro (2brightsparks.com). I tried it, purchased it and never looked back. I keep my two computers in sync with Sync Back Pro today. In 2009, I upgraded my Vista Business machine to Windows 7 Pro on a much larger (500GB) hard drive. At that point, I still had the XP Pro desktop machine and mapping from Windows 7 Pro to XP was very simple. Going the other way was more complicated just like Vista. However, with Sync Back Pro, any changes on either machine were replicated to the other machine with ease and robustness. In 2010, the XP desktop unceremoniously died (the motherboard failed). I purchased a Windows 7 Pro desktop, got my XP files from a USB hard drive enclosure and got running. I had issues mapping a folder on the new Windows 7 desktop from my Windows 7 laptop. This was (at the time) a knockout factor because I keep a large number of documents and QuickBooks databases that change daily. I had to connect the two machines and HomeGroup held no interest to me because the document folders on the desktop are part of C:\ and are not part of C:\users. I quickly shared out the desktop drive to myself, got a connection and synchronized my document folders. 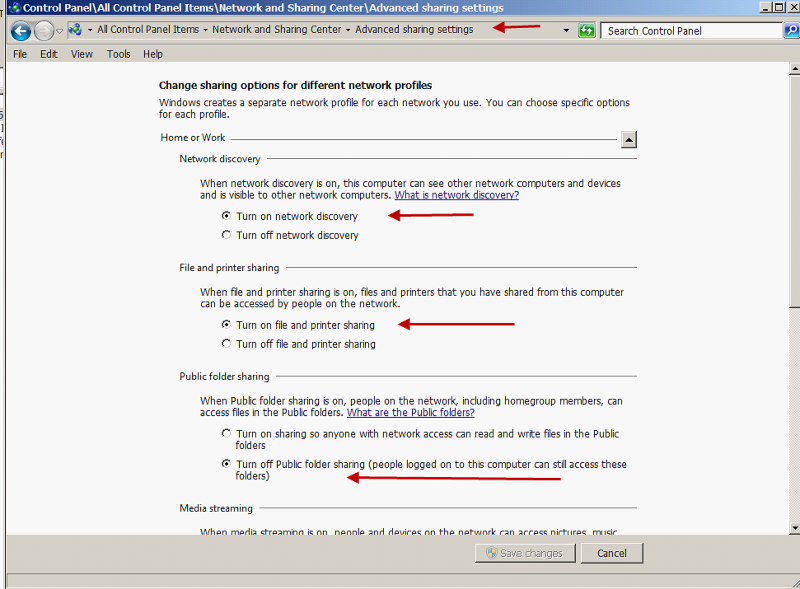 What follows now is a description of how to share folders between two modern computers running Windows 7 Pro or Windows 8 Pro or a combination. You could probably do this in a number of ways, but I shall describe a way that has served me well to interconnect Windows 7, Windows 8 and now my Windows 10 machine over a period of about five years with no problems. I will describe an environment and method where I have a Desktop machine that is my home office machine and a laptop machine that is my travelling consulting machine. My documents tend to change on the laptop and I want to run Sync Back Pro at least daily, if not twice daily, to synchronize documents and files. The machines should be using Windows Pro. If you wish to use home, consider using HomeGroup and sharing public files in C:\users. On the Desktop machine, make a Windows User A that is the same Windows User A and password as for the laptop. If the two machines have the same User name and password, this step can be skipped. 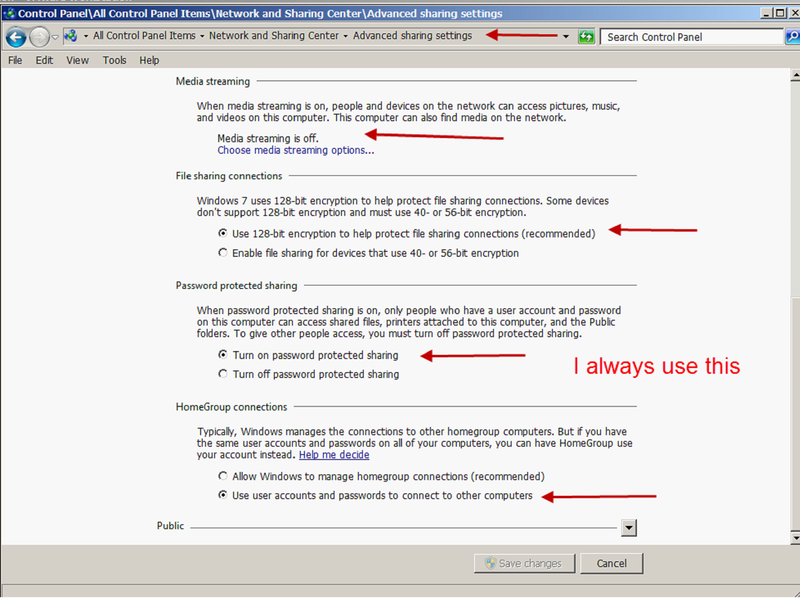 Now share the hard drive (C:\) to the User A and use the password when sharing. It might be easier to share the hard drive C:\ to “Everyone” with the password for User A. Then when User A tries to connect, it will do so very easily. Caution: Sharing to “Everyone” needs to be used with great care. Be very certain the password for User A is complex with letters, numbers and special characters. Make certain that the machine is on a strong router with a good firewall and that the router cannot be externally accessed. In other words, secure your machine to the hilt. Now let us assume that the Desktop machine is Windows 7 Pro. The setup for Windows 8 Pro is very similar but the steps and supporting screenshots I have are for Windows 7 Pro. Go to Control Panel, Network and Sharing Center and make sure the Network card is attached to Home/Work and NOT Public. Media Streaming is Off on my machine. Use User accounts and passwords to connect to other computers (for security and turns HomeGroup Off). Having set this up, set up the Windows 7 Pro or Windows 8 Pro laptop the same way. If Windows 7 Pro, the settings are the same as above. If you are setting this up the first time on either or both computers, restart the computers and verify the settings. In Windows Explorer, Tools, Map Network Drive (or right click on Network on the left side tree and select Map Network Drive. In the box that comes up, select a drive letter (e.g. Z:\) and in the box enter \\name_of_desktop\C$ (if your Windows User is a member of “administrators” and then the user name and password you set up. OK and it should connect. From a command prompt:NET USE Z: \\name_of_desktop\C$username password and press Enter and it should connect. If you have issues, try: NET USE Z: \\IP_address_of_desktop\C$ and press Enter, Authenticate as needed and it should connect. I have covered all the steps here and my computers connect. If you cannot connect, work through the steps again and consider things like anti-virus and firewalls that may be excluding connections. I do have to permit the subnet ranges to my network and to the NAT range of my VMware guest machines in Symantec Endpoint Protection. Firewalls can get in the way and do prevent connections. I set up Sync Back Pro profiles and groups to synchronize my document storage (over 50GB as I noted earlier). Sync Back Pro converts drive letters to UNC paths (optionally) and when I do this, I do not even have to map a drive and Sync Back Pro will still synchronize the document store. I simply never lose a document. How robust is this method? In 2013, I got a ThinkPad X230 Windows 8 Pro laptop (which is now Windows 8.1 Pro) on which I am preparing this article. If took (perhaps) 30 minutes or less to understand advanced sharing in Windows 8, connect it to Windows 7, install Sync Back Pro and create my document storage on Windows 8 (50GB does take a while).Once done, later synchronizations are easy and very fast (5 minutes and usually less). October 1 this year, I downloaded and installed Windows 10 technical preview in VMware Workstation V10. It took me all of 5 minutes or less to connect it to my Windows 7 machine and get files. I moved the VM to my Windows 8.1 machine, adjusted the Drive C:\ sharing settings and Windows 10 can map a folder on the Windows 8.1 machine. Read through the above a second time, check your settings carefully and before you know, you can share your two machines. Good hunting.